Matt Reeves stands deep in the central Virginia woods, head buried in a map of Chicken Mountain, when an electronic buzz grabs his attention. Digital blips and beeps are white noise these days, but this sound comes from a metal detector. And here, a mile from the mansion at James Madison’s Montpelier and far from rusty bottle caps, even the faintest chirp raises pulse rates. Reeves, a boyish 46-year-old with salt-and-pepper hair, is the director of archaeology and landscape restoration at Montpelier, a National Trust Historic Site operated by The Montpelier Foundation. He and a half dozen staff archaeologists and interns are working amid a grid of red surveyor flags sticking up from the leaf litter. Helping them are four visiting metal detectorists, who jumped at the rare chance to swing their machines on one of the country’s most historic private properties. It’s the middle of April, and the hardwoods covering Chicken Mountain—more like a high, domed hill—are bony and bare. Reeves marches over to the buzzing device, held by a ruddy-cheeked retiree with a thin gold loop in his left ear. Mike Cogan, former firefighter and charter-boat captain from Long Island, New York, spades up a dirt-caked sliver of iron as Reeves and a few others edge closer. Gentle rubbing reveals a nail with a convex, four-faceted head—a rosehead nail—made by a quick succession of blows from a blacksmith’s hammer. The technique was common prior to about 1800. And yet Cogan is visibly excited. The rosehead nail is one more clue connecting remote Chicken Mountain to the era of Montpelier’s most famous inhabitant, the father of the U.S. Constitution and America’s fourth president. 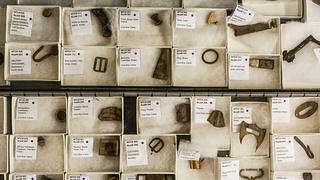 Ammunition, buckles, and knife fragments are among the objects unearthed at Montpelier. On the flip side, diggers, as they call themselves, say archaeologists are elitist and obstructionist, blocking public access to history that should be shared by all. Most diggers are passionate historians, even if they don’t have the Ph.D.s to prove it. They’re fascinated by material culture, especially when it relates to the Civil War. It burns them up to see historic sites sitting unexamined for a lack of funding or archaeological manpower. The feud doesn’t sit well with Reeves. “Both sides need to work together,” he says. To that end, three years ago his department took the unusual step of inviting diggers to Montpelier. Plenty of historic sites, Montpelier included, allow untrained enthusiasts to volunteer for archaeological excavations. But Montpelier was the country’s first to start a program exclusively for amateur metal detectorists. It now runs three sessions per year. Each one lasts four to five days and costs $750, including accommodations and selected meals. To help launch the program, Reeves found an open-minded partner from the opposition: Gary Schafer, general manager of the international consumer business department at Australian metal detector manufacturer Minelab Electronics. “What can we do to bring these two sides together, even though our colleagues are telling us not to bother?” Schafer remembers asking Reeves over dinner. They settled on archaeological training for metal detectorists. Reeves would run the program. Schafer would get the word out in the metal detector community to digging legends such as Chicago Ron, star of the Travel Channel’s Dig Wars, who ended up participating in the program in 2013. Minelab has also helped by offering a limited number of scholarships for the sessions. The industry standard for archaeological surveying is the shovel test pit, or STP. The archaeologist digs an 18-inch deep hole with a roundpoint shovel and sifts for nails, pottery shards, bits of brick, and other historical clues. 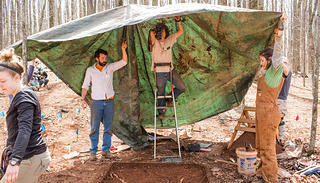 (The standard for excavation—the layer-by-layer removal of soil from 5- by 5-foot squares— is far more labor intensive.) Even using widely spaced STPs, surveying all of Montpelier would take more than 40,000 holes. “We’d still be digging and sifting until the end of time,” says staff archaeologist Eric Schweickart. Equipment at an excavation site in the woods of Chicken Mountain, near Montpelier. Volunteer Dennis Bjorklund focuses on a signal from his metal detector. Metal-detector technology, which uses electromagnetic induction to locate metal in the Earth’s top 12 to 18 inches of soil, has been around since at least the late 19th century. In 1881, Alexander Graham Bell famously used it in an attempt to locate an assassin’s bullet buried in President James Garfield’s chest, but his readings were reportedly thrown off by metal bedsprings. By World War II, improvements in accuracy, energy efficiency, battery technology, and portability made the devices useful for safely locating landmines. After the war, a few startup companies, including White’s Electronics of Oregon and, later, Texas-based Garrett Metal Detectors, designed affordable handheld metal detectors for treasure-seekers. The manufacturers tuned the machines to buzz in slightly different ways to distinguish between, say, aluminum and gold. These devices proved perfect for finding scattered pocket change and wedding bands at parks and beaches, but they also began turning up Civil War relics. A gold rush of hobbyists scouring former Union and Confederate camp and battle sites essentially created the now-flourishing relics market, where a belt buckle might sell for $1,000 or more. Diggers turned up 110 objects within the first hour. Sold on the technique, Scott and Fox deployed an army of roughly 30 machine- swinging volunteers, who helped them locate more than 5,000 artifacts—with enough context to accurately map the action of Custer’s last stand for the first time ever. In 1998, as a newly minted Ph.D., Reeves was serving as principal investigator and project director for a Manassas National Battlefield Park project. He cold-called Don London, then president of the Northern Virginia Relic Hunters Association, and asked if London’s metal-detecting club members would help with a survey—an unusual question, because it’s normally illegal to use metal detectors on National Park Service land. After the success at Manassas, Reeves had purchased a couple of metal detectors for his Montpelier staff, but the machines didn’t turn up much. Crosby, Reeves’ neighbor, dropped by one day with his White’s machine dialed in to the local soil conditions. 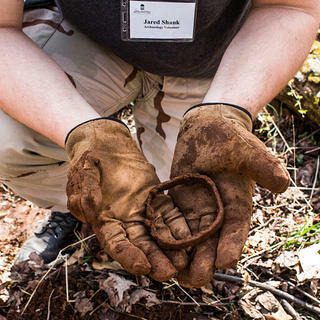 Within a few hours, his well-tuned ear helped him find more than 40 artifacts, including nails and buttons from a Confederate encampment. In 2008, Reeves hired Crosby as a part-time digger at Montpelier. Plans were afoot to harvest timber from Montpelier’s East Woods, so Reeves sent Crosby and an archaeologist there to conduct a survey. Each time his machine buzzed, Crosby dug, and the archaeologist recorded the find with its GPS coordinates and marked the spot by jabbing a colored flag in the earth. Later, all the information they’d collected was entered into a computermapping database. You can hear the awe in Reeves’s voice as he recounts the story one morning during a PowerPoint presentation in Montpelier’s archaeology lab. Munching pastries and sipping coffee from the lab’s mismatched collection of mugs, visiting metal detectorists watch from folding chairs as Reeves clicks through a series of images before pausing on a detailed map of Crosby’s handiwork. On the map, a spaghetti-like mass of lines—the GPS-tracked routes Crosby walked—intersects with hundreds of dots. Each dot is a hit, catalogued by a sequential LC (Lance Crosby) number. Reeves clicks on a dot, and data pops up—whether the find was a bullet or nail, for example, style of nailhead, soil depth, and so on. Based on the results of Crosby’s survey, the archaeology team used a laser transit to grid out key areas for further investigation. 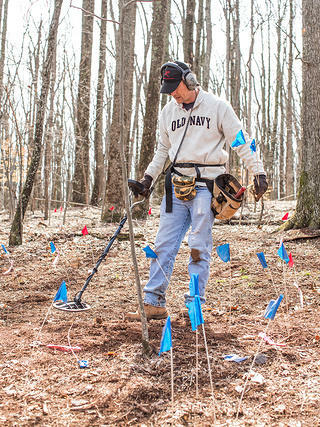 Ultimately, the evidence they found—including buckles and bullets—revealed that Montpelier’s East Woods had served as a massive infantry camp during the Civil War. Plans to log the area were canceled. Montpelier staffer Eric Schweickart photographs the bottom of an excavation layer with the help of co-workers Terry Brock, left, and Aryel Rigano. Back in the woods of Chicken Mountain, everyone’s pausing for a brief lesson in hot soil. “Every once in a while, you’ll hear blips and pops and think you’ve got something,” says Crosby, wearing old work boots and comfortably faded clothes. The diggers, cradling detectors, watch with rapt attention. Direct but unhurried, he squats and scrapes away a layer of leaves. “You might see a spot like this,” he says, uncovering a red-clay lump poking out of brown loam, “where a tree fall or a burrowing animal has brought up the subsoil.” Concentrations of the red, iron-rich clay—hot soil, diggers call it—can trick even the best machines. “If you’re not used to digging in Virginia soil, it will really throw you off." As with the East Woods, Chicken Mountain was slated for logging, but those plans have been effectively canceled now that Crosby and the visiting diggers have begun finding Madison-era nails. 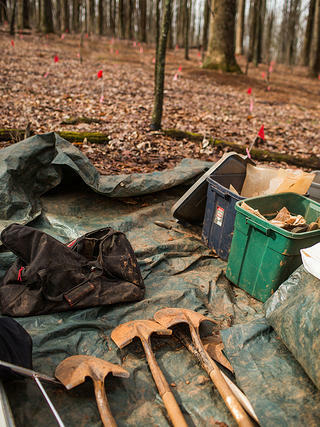 Reeves suspects the site once housed quarters for enslaved workers, but he needs more evidence. Now his archaeology team must excavate and sift for brick, bone, china, and other, mostly nonmetal artifacts before reaching a conclusion. Montpelier’s visiting metal detectorist program appears to be working, at least in the short term. Time will tell whether Reeves can meet his long-term goal of increasing public outreach. To many outsiders, archaeology seems like an arcane discipline with little relevance to their daily lives. In an era of budget cuts and technological innovation, the field’s at risk, and Reeves knows it. ONLINE EXCLUSIVE: Katherine Flynn interviews Little Bighorn archaeologist Douglas Scott on how metal detectorists and archaeologists can work together.